Spread cubed, cooked chicken into bottom of pan (I used chicken breast, but this is an S meal, so you can use whatever part of the chicken you want). Pour chicken stock over chicken. Drop the chunks of cream cheese around on top of chicken. Add salt, pepper, garlic powder, & onion powder dusting the top. Sprinkle cheddar cheese over seasonings. In a separate bowl, use a fork to mash up the topping ingredients until they are pretty well mixed. 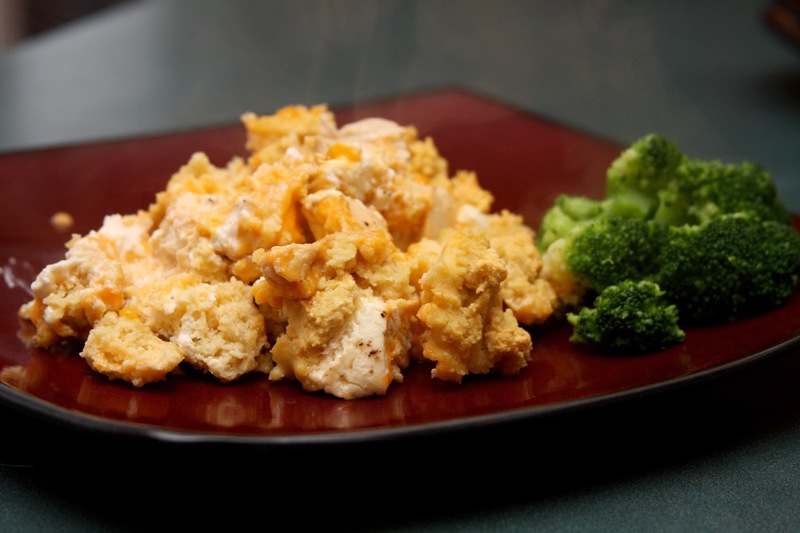 Chunk this mixture on the top of the casserole so the chunks are spread evenly over the top. You don't need to smear this topping over the casserole. I have everything except oat fiber....can I replace it with something else or where can I get it/make it? Thanks so much! Try using either more almond meal/flour or coconut flour. I buy my oat fiber at netrition.com, currently. Excited to try this recipe... gonna experiment with an alternative to the oat flour. Thanks for sharing it! This looks amazing and I can't wait to make this tomorrow! Just finished cooking my chicken so it will go quick tomorrow:) However I was wondering, what size dish do you use? Thanks! Has anyone done this with veggies and what did you use? I made this for dinner tonight and it was very, very good. Definitely had that comfort food thing goin' on. Thank you for sharing your creation. Someone asked what size pan to use. I used my 10 x 10 Corning Ware pan and it worked perfectly, so I imagine you could use an 8 x 8 pan too.